Shade sails can be installed singly or as multiple sails to cover a larger area. The choice of the type and disposition of the sails is driven by the area to be shaded and the attachment points available. 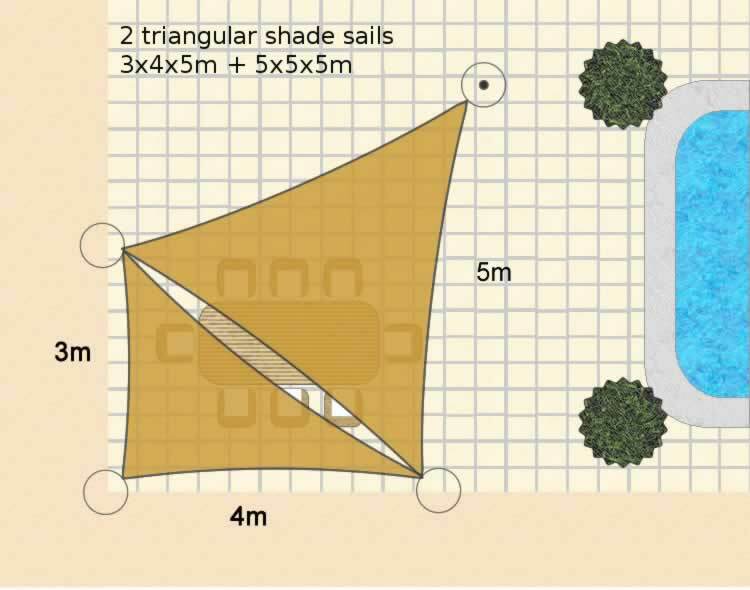 For example, to cover a large corner space, it is possible to use two standard size sails and only one mounting post, with a 5m equilateral triangle and a 3x4x5m right angle triangle. 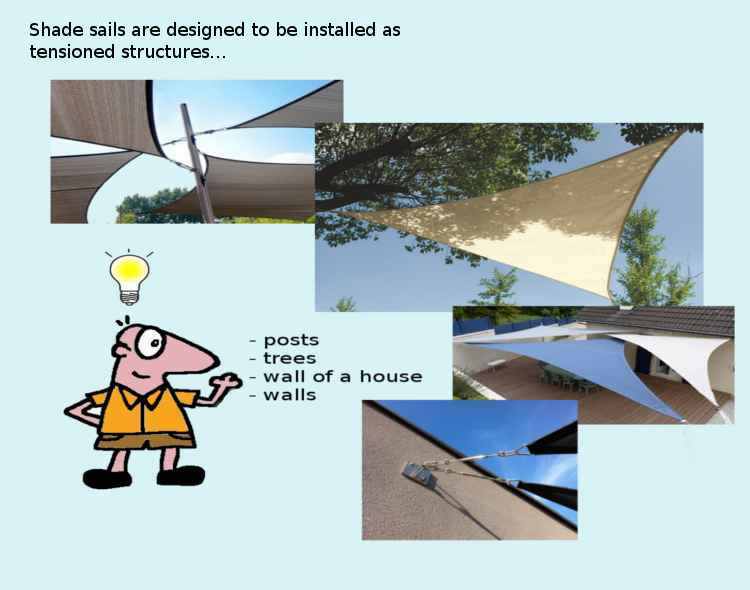 Shade Sails are designed to be installed as fully tensioned structures - the amount of tension required depends on the size of the sail and the degree of wind exposure. Larger sails and windy locations will require higher tension. If the area to be shaded is completely sheltered from the wind, or indoors, the sail can simply be tensioned sufficiently to remove the slack. Safety First - Mounting points must be carefully chosen, some potential mounting points may not be suitable for resisting the tension forces. 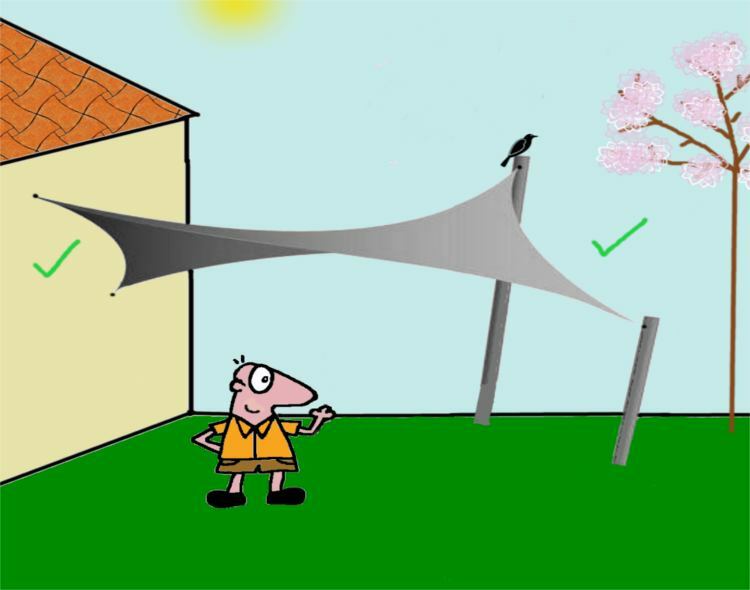 In a typical outdoor installation of a sail with a surface area of up to 25m2, a tension of 30-60Kg will be required at each corner. This initial tension will increase in windy conditions by as much as ten times so the fittings and mounting points must be able to withstand very large forces. Faced with this requirement, the mounting points must be very carefully selected - an existing structure such as the wall of a house would be suitable whereas a small tree or wooden fence post may not be sufficiently robust. Shade screens are a shade product that are related to shade sails but have some key differences. 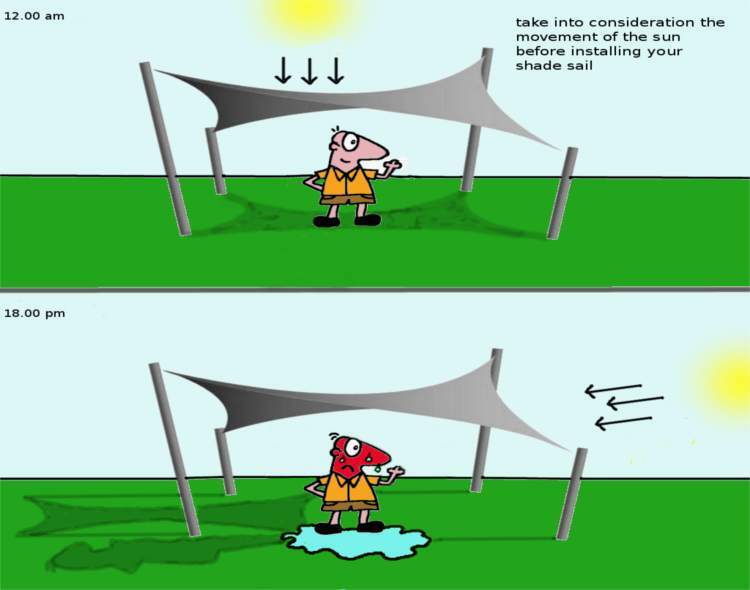 In planning the layout of a shade structure the movement of the sun must be considered to take account of the position of the sun at different times of day and during different months of the year. 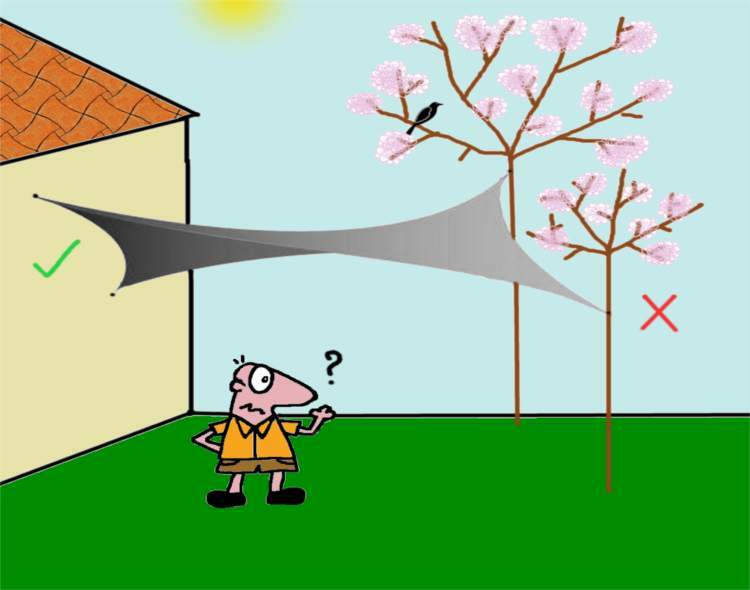 Most shade is likely to be required during the summer season, particularly during the afternoon and early evening. 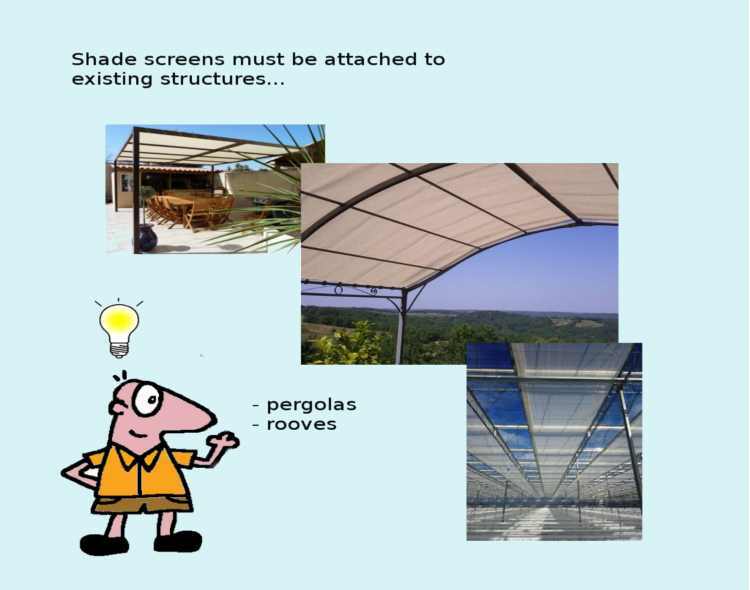 As a tensioned shade structure is designed to remain in place there will often be a compromise in terms of optimum afternoon and evening shade. In the afternoon the sun can be almost vertically overhead but in the evening it may still be very hot but with the sun much lower in the sky. A more visually attractive solution will have varying heights for the attachment points and a slope to allow heavy rain to run off. 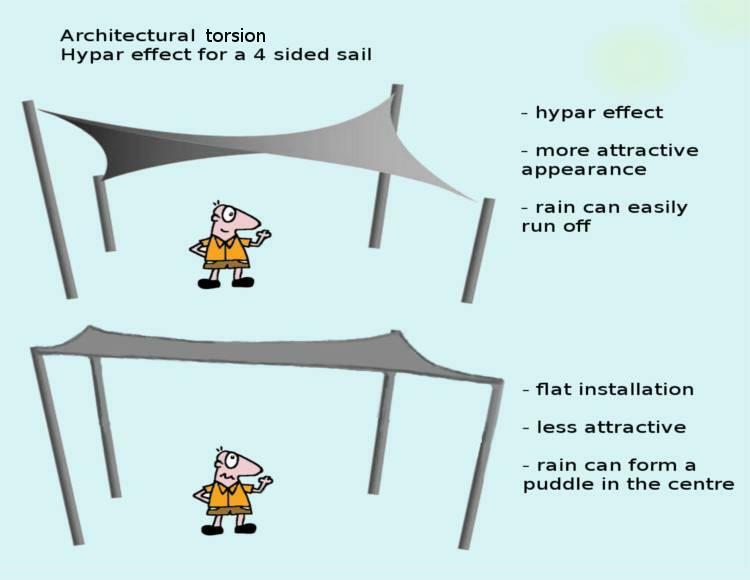 In the case of a four sided sail they can be installed with torsion for a hypar architectural effect. 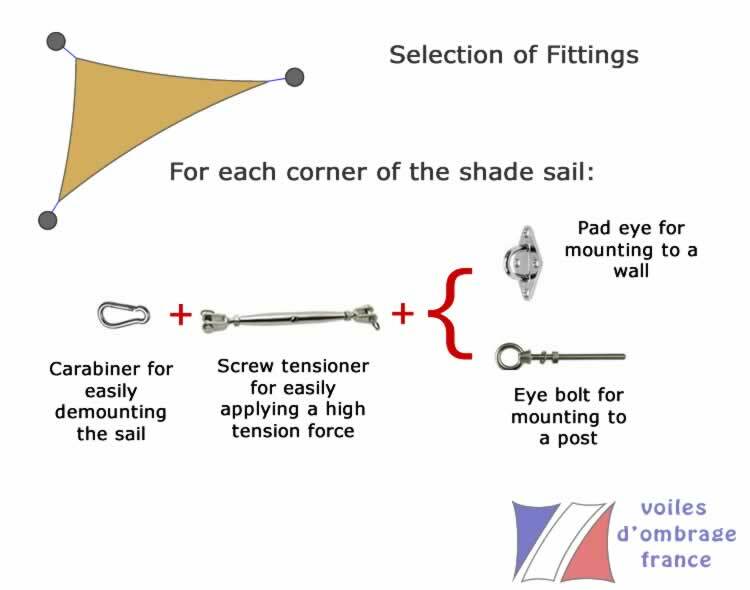 In order to fully tighten the shade sail it is necessary to leave a gap between the sail and the fixing points for the adjusting tensioners and to allow for the stretch of the sail under tension. An allowance of 300mm would be suitable for sails of up to 30m2 - this being the distance between the fixing ring of the untensioned sail and the attachment point. This allowance, together with the curved edges of the sail means that the shaded area will be a little less than might be expected. Also note that if two sails are installed side by side, there will be an unshaded area between the two due to the curved edges. This can be avoided by overlapping the sails, but they should not be allowed to touch as this will damage the fabric. Precaution is required when considering attaching to existing structures, such as your home. In the event of bad weather and strong winds, the loads applied to the fastenings by the sail can be enormous and should not be underestimated. To ensure that your existing structure is appropriate to support these loads, it may be necessary to consult a qualified builder. We recommend that you remove the sail when the weather forecast predicts strong winds. Using a carabiner (snap hook) at each mounting point will allow a shade sail to be taken down in less than 5 minutes. What Type of Fasteners are Required? Mounting Posts - Wood or Metal? In order to resist the high forces at the mounting points, shade sail mounting posts must be of adequate diameter and securely embedded in the ground. Wooden posts can provide an economical solution but must be of at least 125mm diameter and be pressure treated against rot. Steel posts are generally a more expensive solution with painted or galvanised steel being significantly cheaper than stainless. Bear in mind that steel posts are hollow and have a relatively thin wall diameter of only a few mm, so what may appear to be a very substantial metal post will not necessarily be as resistant as a wooden post of the same diameter. The following table provides a guideline to selecting metal posts, depending on the sail size and wind conditions. Metal posts can be supplied for embedding in a concrete foundation or with a mounting plate for bolting to the floor. 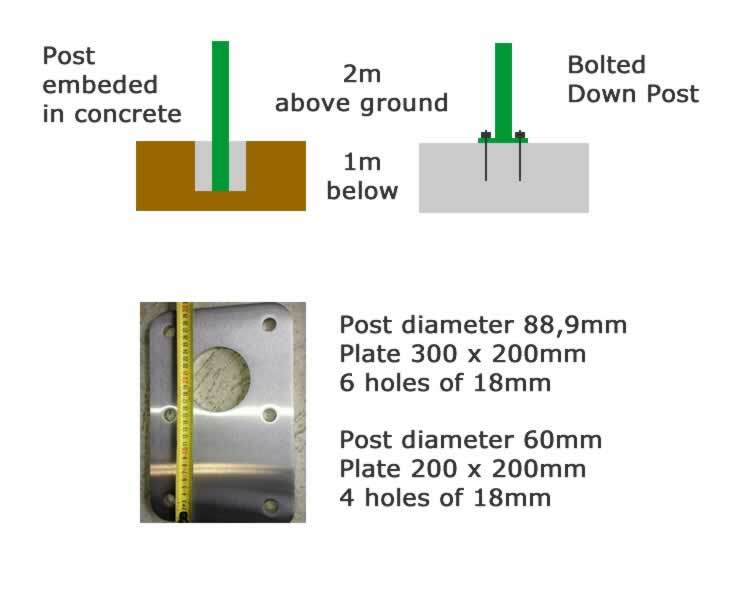 The normal guideline for a post embedded in concrete is that there should be two thirds of the post above ground and one third of the post below ground. For an above ground height of 2m, a total post length of 3m will be required, with 1m embedded in concrete. The diameter of the hole would typically be 350mm, but this is less important than the overall depth of the hole. In addition the diameter of the pole and the prevailing ground conditions will influence the diameter of the hole required. Clean the area where the shade sail is to be installed. Carefully unpack the shade sail without using any sharp object as this can easily damage the sail material. Spread the sail out on the ground and attach the fasteners at each corner. We recommend that the sail is fitted with a tensioner and a carabiner at each corner. The screw tensioners allow a large amount of force to be easily and evenly applied to the sail and the carabiner allow the sail to be quickly demounted if strong winds are forecast. Slacken the screw tensioners until they are at their longest settings. Taking each corner in turn, fasten the fully extended tensioners to the selected mounting point at each corner of the sail. The material of the sail is designed to stretch during installation and some force may be required to attach the last mounting points, even with the tensioners fully extended. This is quite normal and not an indication that the shade sail is too small. Apply tension evenly at each corner of the sail - do not fully tension one corner before applying tension to the remaining mounting points. 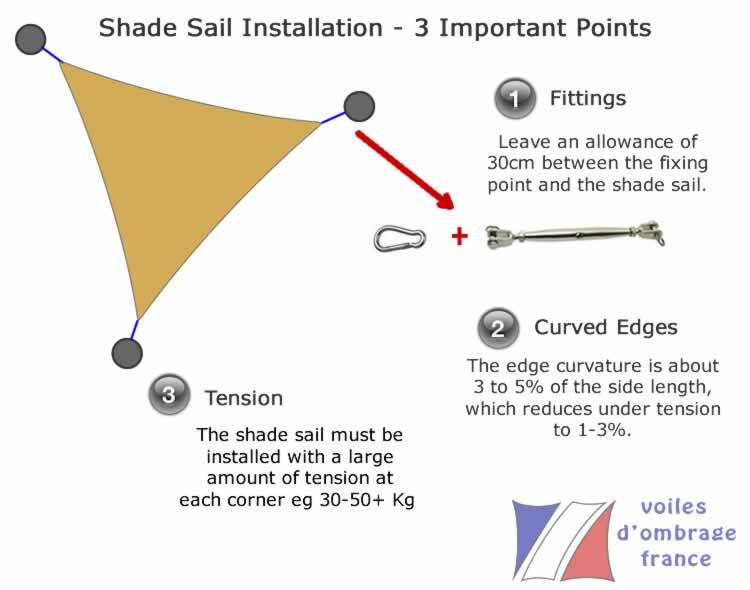 The recommended final tension varies with sail size but is typically 30-50Kg at each corner for sails up to 25m2. Larger sails will require much higher tension. After a week of use, we recommend retensioning to allow for any settling of the sail. In addition it is advisable to recheck the sail tension after it has been exposed to windy conditions. If you have any questions about this guide or shade sails in general, please contact us.